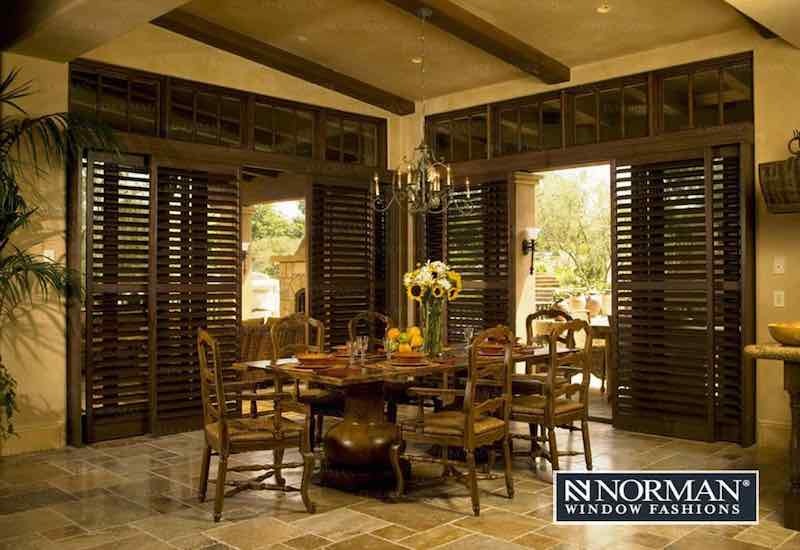 Besides selling custom window blinds and shades, Fusion Windows and Doors is proud to offer custom shutters by Norman®. Norman window cover designs and fashions represent all the excellence in quality and creative vision that we ourselves fully embrace and strive for. Their manufacturing practices and ethics are positively innovative, rigorous, and Green! With over 30 years of experience in the business, Norman Window Fashions is one of the world’s largest manufacturers of window coverings. Being dedicated to environmental friendliness, they go to great lengths by doing such things as farming their own wood and creating their own components. They even weave their own draw cords. You can feel good about using Norman interior window coverings in your home, as we do about supplying and installing their products for our customers. Such commitment to quality and craftsmanship is the centerpiece of Norman Window Fashions (Norman Shutters, Blinds and Shades). It is reflected in the window coverings they sell, year after year. With innovations and persistence on durable window shutter designs they have become a favorite by homeowners too. There are many design choices to dynamically revamp and revitalize the look and feel of your current living spaces, and plenty more to develop your own unique vision from scratch if you wish. Our impressive collection of materials lets you combine textures and colors in your own unique way and will bring out the interior design artist in you. You can trust you’ll find that extra something that really reflects who you are and what you want to say. What Shutter Material is Right for Your Project? Norman’s full line of premium custom shutters, ranging from wood composite, advanced polymer, to environmentally friendly wood shutters and prestigious solid wood will enhance your home design and the experience of owning the products. With the wide section of materials you will be able to find the right coverings for your windows. Let us go through some of these products with you, here at Fusion Windows and Doors. Together, we can pick and help install the new additions or replacements that match your style, lasting for years to come. Our friendly staff will guide you through the entire process to make it a fun and enjoyable experience. Give us a call or fill out our convenient online form for a friendly and knowledgeable consultation. We are fully confident in our selection of beautiful product designs that will delight and appeal to suit any decorating style. We offer suggestions based on the visual statement or image you would like to make in your home, whether it be one of country charm, contemporary style, or simple elegance. We have it all, including windows and doors for your coverings!